The Southern magnolia (Magnolia grandiflora) is a flowering evergreen desirable for its beautifully scented, creamy white flowers. The tree can grow up to 80 feet tall, according to Texas A&M University, and is a showpiece in any suitable landscape. There are dwarf cultivars of the tree as well, for smaller home gardens, which reach a maximum height of only 12 feet. This showy, attractive tree deserves companion plants that will complement it, not compete with it. The first consideration when choosing companion plants for the Southern magnolia is the climate. Southern magnolias grow best in U.S. Department of Agriculture plant hardiness zones 7 through 10A. They will not grow well in very hot or cold climates. Companion plants chosen for this tree should thrive in the same hardiness zones. Magnolia grandiflora trees have dense canopies and shallow roots, which make them difficult to plant under. In addition, these trees tend to drop a lot of debris. 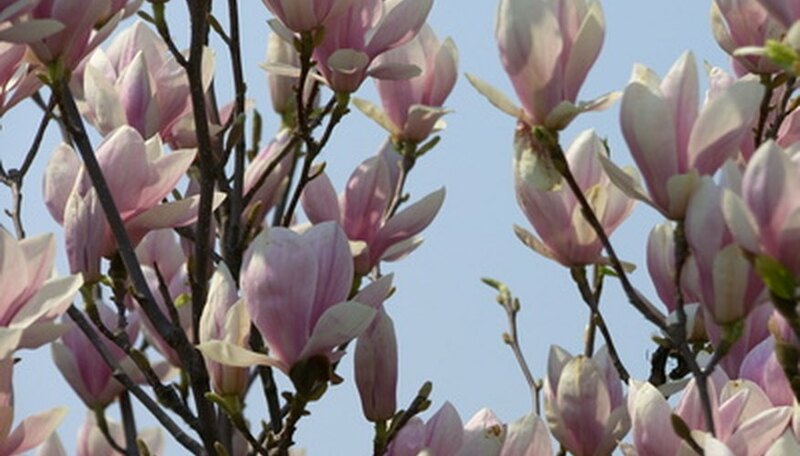 Companion plants placed under a magnolia must grow well in dappled or even full shade, and they must not mind competition for nutrients from the tree's roots. Finally, they must be hardy so that they are not damaged (or even buried) by the large, shedding leaves. Companion plants should visually compliment the Southern magnolia. Choose plants that will bloom when the tree is not blooming, so that there are always flowers in the vicinity. In addition, choose plants and flowers that will fill the space vertically. Avoid choosing plants that might climb and damage the tree, such as some ivies, as the tree has weak bark, according to the University of Florida. Spring-flowering bulbs are hardy, spread easily and can compete with the roots of the magnolia. Many can also grow well in the shade, and they provide vertical interest to draw the eye upward along the trunk of the tree. Try planting cyclamens, lilies-of-the-valley, bluebells and daffodils to create a woodland feel. Shrubs provide a more formal feel around your magnolia. Choose shrubs that bloom in the summer, rather than in the spring, so that the blossoms don't compete with the spring-blooming magnolia. Try weigelas, which will continue to bloom all summer long and come in a wide variety of cultivars for every climate. Plant them at the edge of the tree's canopy so they can get some sunlight. Hydrangeas and some rhododendrons are shade-loving, flowering shrubs. Choose a cultivar that blooms in late spring or early summer.